and built-in 13pin for easy access and fast tracking to your favorite guitar synth. Watch the video and read below to learn more. • Class Compliant - It will be recognized by your computer right away! 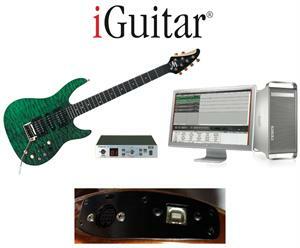 Note: This is our first generation iGuitar.USB model, it is sending digital audio and eliminates the need for an external audio interface. Click here to see a typical 13.USB set up. This is one of our most popular upgrades, adding both 13pin and USB features to your guitar.